The 2012 Hainan Rendez-Vous(HRV), China’s leading luxury lifestyle event, will see showcases of 230 international brands at the Sanya Hongzhou Interntional Yacht Marina from April 5 to 8. According to the organizing committee, the exhibition area consists of 88,000 sqm of on-water area and 32,000 sqm of on-land area. A fleet of 130 yachts, including more than 20 from the world’s top 5 yacht groups, will feature in the four-day event. With the support of Wang Dafu, the President of the Sanya Hongzhou International Yacht Club, the event has created several amazing opportunities for the development of the yacht industry on the island. 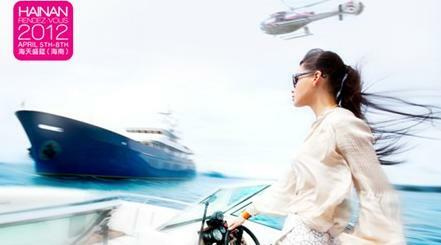 At present, a good number of the 20 yacht brands have set up their offices to expand their market in Sanya. Besides yachting, it is also the largest business jet event in Asia with 21 leading brands of business jets to be displayed this year. Over 300 China’s ultra high net worth individuals will arrive to the shores of Sanya with their own private business jets. Further activities and attractions under planning include a wide range of parties, special VIP lounges and exclusive gala dinners thrown by event sponsors and participants. As the only exhibition exclusively dedicated to business jets, large yachts and luxury lifestyle, HRV plays an increasingly important role in bringing together international elites to exchange ideas as well as promoting high-end consumptions in Hainan.